I am so very excited to share something special with everyone today! Last week, I shared how to make these cute wire cursive names and today I am sharing how I am using them: A family themed Christmas tree! Like most, we have family visit us every Christmas and I wanted to do something special for them. Family is important to me and although we have many traditions, this will be our new Christmas tradition. I was inspired by an advent calendar I saw a long time ago with treats in little boxes for each day. My version is slightly different because rather than each day, I have a treat box for each family member (all 18 of them). To add to the family theme of the tree, I also made these simple ornaments with a few family pictures. You may not recognize these 3 gentle souls but that tiny guy is my sweet son almost 7 years ago. Gosh, he is growing up so fast! Now, after I made my boxes, I was still faced with one problem. What do I put in them?! I racked my brain until one day it dawned on me that I live in a family of rabid coffee drinkers. You do NOT want to get in their way! In fact, I am the only one (except the kids) who does not drink coffee. However, I do love a good hot cocoa. I came across these individualized k-cups and hot cocoa pouches and I knew they would be perfect for my Family Gift Tree. This box is super simple to make. Hot glue the ribbon on the bottom of the box in a cross with the ends inside the box. Repeat for the top. 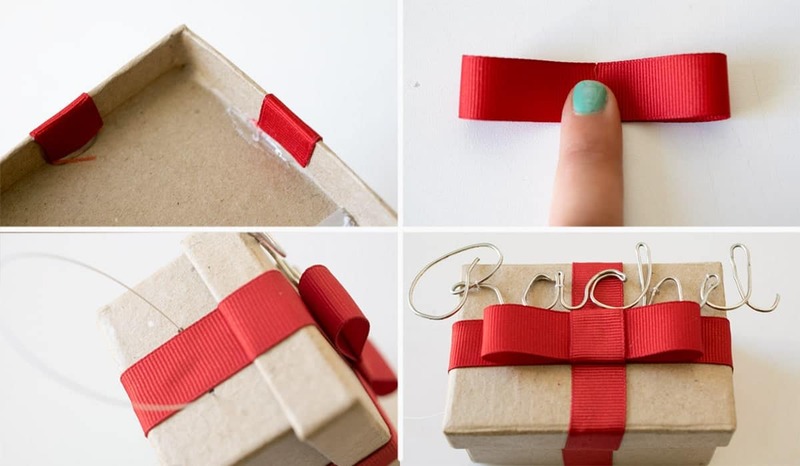 To make a bow, cut a length of ribbon about 1 1/2 the width of the box. Fold in half and crease. Put a dab of hot glue along the crease. Lay out flat and bring each end into the center and press into the glue (be careful not to touch the glue though!) Take a second shorter length of ribbon and wrap around the center perpendicularly. Put a dab of hot glue on the back side where the ends are. Attach bow to box with more hot glue. Either write the names with the paint pen or attach the wire names using the hanging wire. I poked a few tiny holes into the box lid and sewed the names on. Finally, poke two holes on either side of the ribbon on one end or in the corner. Loop the jewelry wire and tie in a knot to hang the ornament. I bet you have some awesome and unique family traditions during the holidays. I am always so curious about how other families celebrate. Share them with me in the comments below! The more unique, the better! Or if you are looking for a new tradition to start this year, Christmas morning mocha bar anyone?! Amazing! I love your creativity. thank you for sharing such a nice idea. I am in serious love with your gift tree. 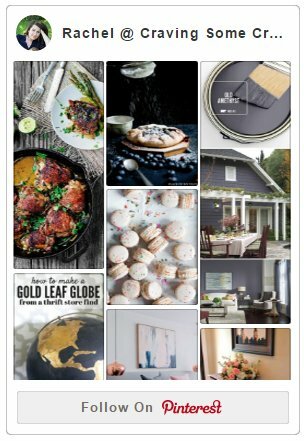 The wire names are so neat and I hope you don’t mind if I use it in a round-up. Love love love! Of course I don’t! I am glad you love it so much! These are so cute and creative, I love playing with wire and this would be so easy and a perfect keepsake as a gift. They could hang up their wire name as an ornament or put it on their desk. Those boxes with the names are so cute! I love that the little K-cup fits right in. What a fun surprise for all your family members. This is such a fun idea, Rachel! And those package ornaments are adorable! I’m pinning this and popping over to learn how to make those wire names. Your family is going to love this tree! Great post! OH, this is ADORABLE! What a lucky family, thanks for sharing, I”ll have to steal! Oh my gosh! Your tree looks so dreamy with all the boxes and red bows! Love this idea — and also love starbucks. What a great idea! My in laws come for Christmas and they drink coffee like they will die without it! Totally going to do this! What a clever and great idea! I especially love the wire names! !